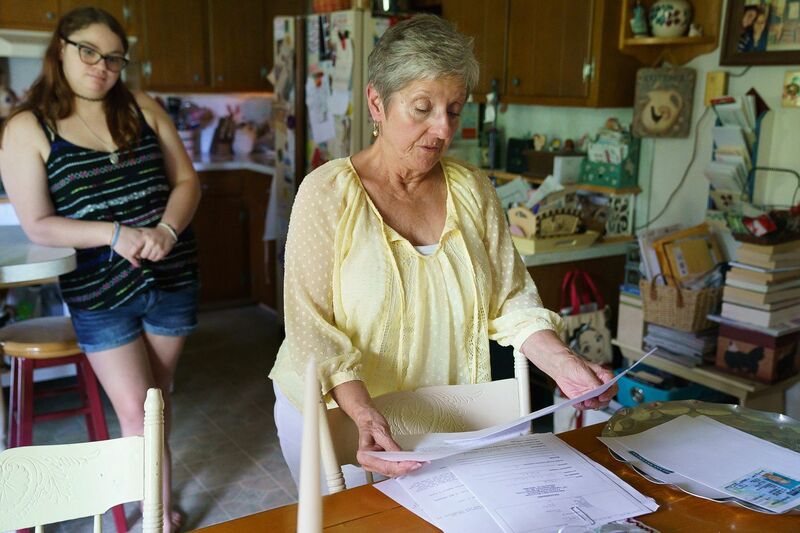 In her Gilbertsville, Pa., home, Susan Scott holds some of the "proof of life" documents she needed to prove to Social Security she is actually alive, after the agency listed her as dead. In the background is her granddaughter, Taryn Scott. Until Tuesday, Susan Scott was dead. The 70-year-old retired registered nurse found out she was dead when a credit union transaction she tried to make was blocked. The bank manager told Scott that Social Security had notified the bank she died in June. Scott was understandably stunned. As she told me her story, my mind went to the famous Mark Twain quip, "The report of my death was an exaggeration." The false death report didn't hurt Twain, but Scott was cut off from banking, her Social Security and pension checks, and, worst of all, Medicare. She was forced to postpone a glaucoma procedure because Medicare doesn't approve surgery for dead people. She was forced to provide proof of life to various bureaucracies, including the one that laid her in her grave — Social Security, she tells me. Scott is very chatty for a corpse. When a person dies, Social Security spokeswoman Vivian Nichols tells me, the death usually is reported to Social Security by the funeral director. Social Security then provides the data to the Department of Commerce's National Technical Information service, a clearinghouse that distributes it. If a mistake is made in recording the deceased's name or Social Security number, uh-oh, the wrong person is listed as deceased. That seems to be what happened in Scott's case, but Nichols could not be sure. Anyone can make a mistake — but why can't the mistake be rectified quickly? "It's the most frustrating experience of my life," says Scott, who was widowed in 2003 and has two grown sons. She spent days on the phone telling everyone — mortgage, credit cards, car loan, pension — she was not dead. "Each one required different proof to be mailed or faxed," she says with exasperation. It takes time to do the correction, Nichols says, because it is done manually. Yeah, but it's been more than two weeks. Although she is worried about her checks, Scott's major concern is getting square with Medicare so she can reschedule her glaucoma surgery. Each day's delay puts her eyesight at risk, she says. The first time she called Social Security, she was told to go into the local office "every day and ask for an update until they fix it," she says. Susan Scott, with granddaughter Taryn, waits her turn in the Social Security office in Limerick. Scott didn't go every day because she lives in Gilbertsville, Montgomery County, and the nearest Social Security office is in Limerick, almost a half-hour away by car. "Gas is expensive," she says. I accompany Scott on her fifth visit to the Limerick office along with her granddaughter Taryn Scott, 24, who acts as her witness. Unlike previous visits, which required a wait of more than two hours, we are called to the clerk in less than a half-hour. "I know why you're here," says the clerk, who recognizes Scott. The correction is "in the system," says the clerk, but she can't say how long it will be before it is posted. She hands Scott her phone number so she can call in instead of coming in. That went well, but Scott was still dead and her surgery still couldn't be booked. When I got back to my office I contacted Nichols at Social Security, who responded promptly. Nichols called Scott, gathered the info, and swung into action. I don't know what she did — fairy dust, maybe? — but on Tuesday, Scott had her Lazarus moment: She was raised from the dead. Relieved, Scott reached for her phone to reschedule her glaucoma surgery. "It's great to be alive," she said with a laugh.